Pilates Studio Omaha: Have You Tried the Reformer? There are many pieces of Pilates equipment out there for students to use as they shape and tone their bodies. However, none are quite as popular as the Pilates reformer, and many Pilates studios incorporate these machines into their workouts. At CORE10 Pilates in Omaha, we love this piece of equipment so much that we have devoted an entire post to it. Today, we will review the reformer in depth and discuss what it is, how you use it, and how you can benefit from it. 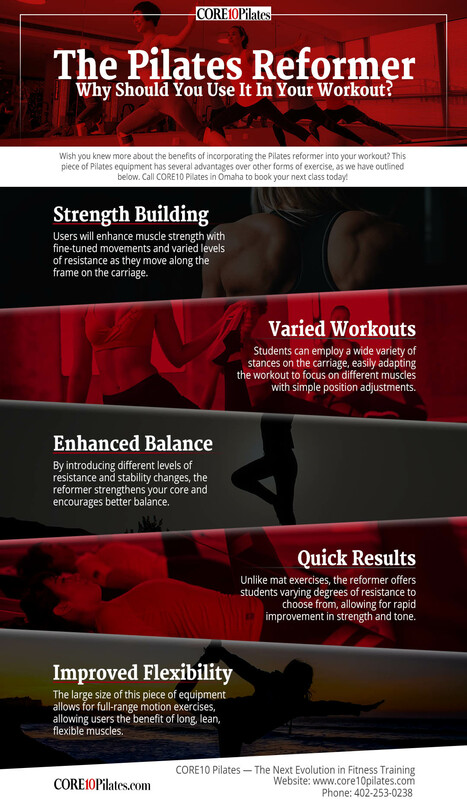 Stop by our studio and book a class to experience it for yourself, and in the meantime, read on to learn more about this awesome machine! Invented by the founder of Pilates himself, the reformer is an L-shaped machine that features a metal frame and a flat, sliding platform on it that is referred to as a “carriage.” On one end, the carriage is attached to the frame by various springs, each of which offers a different amount of resistance as users push or pull the carriage on the frame. The reformer also features a footbar, shoulder blocks, and long straps with handles on them to enhance the intensity of your workout. Although the reformer can be intimidating at first glance, don’t worry! Our trainers will gladly show you how to safely perform the most effective movements. This piece of Pilates equipment is so versatile that it can be used in a wide variety of ways. Depending on your desired results, you may be instructed to lie down, stand, lay sideways, or position yourself in another manner as you push or pull the carriage along the tracks on the frame. Strength building. Fine-tuned movements and resistance are essential in strength training, and users will experience both of these elements as they move along the frame on the carriage. Varied workouts. There are many different types of workouts that can be completed on the reformer. You can easily focus on different muscles with just a simple adjustment in your position on the carriage. Enhances balance. 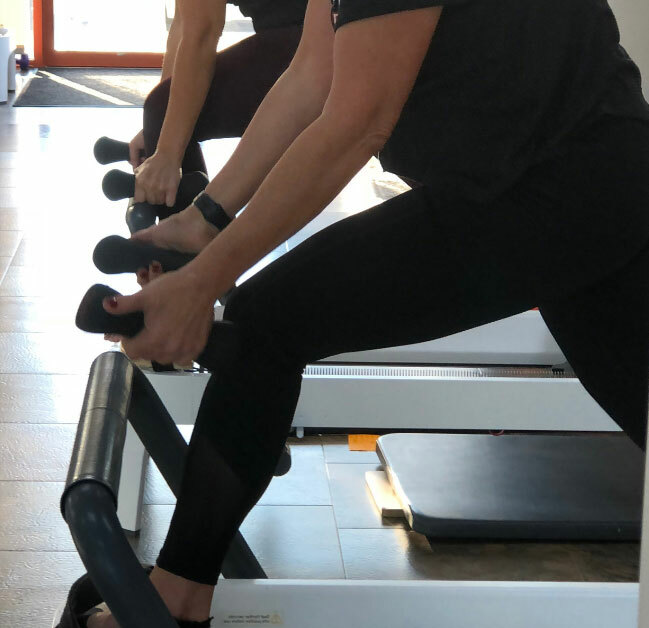 The reformer takes an average Pilates session to the next level by introducing different levels of resistance and stability changes, strengthening your core and encouraging better balance. Fast results. While mat exercises may offer many of the same benefits, they rarely deliver the amount of resistance that can be obtained through the reformer. The more resistance you incorporate into your workout, the faster you’re likely to see results. Improved flexibility. Those who are to their mat exercises may first balk at the size of the reformer machine. However, the large size of this piece of equipment allows for full-range motion exercises, allowing users the benefit of long, lean, flexible muscles. Students love the reformer for many reasons. If you’re curious about how you can benefit from incorporating this innovative piece of Pilates equipment into your workout, our trainers would love to talk to you. Are you ready to take your Pilates workout to the next level? CORE10 Pilates in Omaha offers both private sessions and traditional group classes to help you discover the reformer and unlock your hidden strength training potential. Book your free intro class online today or call us at 402-253-0238 to learn more!